Two of the 19 angry white men who threatened federal agents have plead guilty to conspiring with others at the Bundy Ranch stand-off in 2014. The one on the left is co-chair of Vets for Trump. When Trump loses in November, angry white men are going to take it out on people they believe stopped Trump: Progressives, Democrats and women. They will also go after the people they believe made America crappy for them: immigrants, Muslims, people of color, the LGBT community and of course, the "liberal media." The professional defeated Trump supporters will get jobs in media and in the right-wing complain-o-sphere taking money from billionaires while attacking all things Democratic. The ones to look out for are the "2nd Amendment people" Trump was referring to when it came time for President Clinton to appoint Supreme Court Justices. All it will take to set them off are a few "sarcastic" Trump Tweets. The good news is there is a program set up to deal with these angry white men and their threats that seems to be working. DeLemus and Cooper are the first two to be sent through this system. I think it's important we pay attention to it because the program will be attacked by the right--since they are ones primarily being busted by it. The right will want the left to join them in condemning these arrests and prison sentences using lefty messages: "See? The government is spying on people! They are trying to block people's right to assemble for peaceful protests! They are trying to stifle free speech!" The mainstream media will go back to Vietnam war protests, The Weather Underground, and eco-terrorists" for their, "Both sides do it" stories to provide "balance." But the reality is that the left has long known not to be armed for their protests. They know not to support armed protesters. When they are unarmed, they have the moral high ground and public sympathy. Following Trump’s loss, Fox News and right-wing radio hosts like Hannity will continue to support “Patriots” who want to “take back America” with bullets instead of ballots. Like before, people who organize armed responses to government actions will get plenty of air time with no hard questions. However, this time around people will know that the Bundy’s and their militia buddies didn’t get away with conspiring to get people with guns to threaten others. Everyone can now see the consequences to people who threatened others with guns. I want all individual activists who are threatened by angry white men with guns to know about this case, especially Coopers’ story. Neither Cooper nor DeLemus were actually at the event/stand-off. He [Cooper] told the judge he interfered with the execution of federal court orders by recruiting armed gunmen to display support for Bundy and his sons Ammon Bundy, Ryan Bundy, Mel Bundy and Dave Bundy and stop the roundup of the family’s cattle from the scenic Gold Butte area. The program I mentioned above? It’s how the system is supposed to work, there are laws, people break them, they are arrested and tried using compelling evidence. A judgement, proportional to the crime, is rendered. The person pays the fine, serves time and suffers other consequences, such as losing their right to own guns. 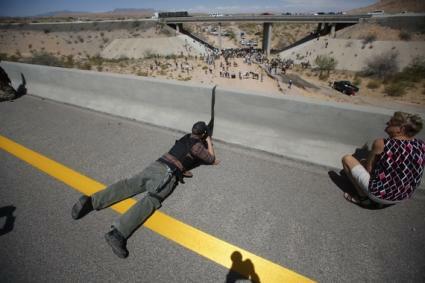 I’m glad that these two are going to prison because when the armed protestors at the Bundy Ranch pointed their guns at Federal officers, there were no arrests. This was very discouraging. The government tip-toed around the whole situation because they were afraid of another Waco or Ruby Ridge. 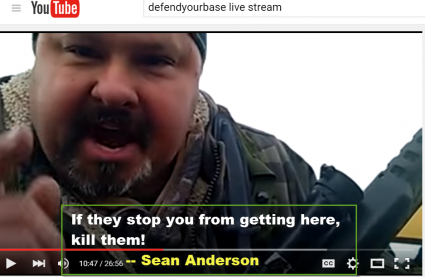 At the time I suspected that the FBI and DoJ cut deals with these Bundy Ranch thugs, but it wasn’t until some of the same people were arrested at the Oregon Wildlife preserve take over did I see the evidence of the deals (I wrote about it here). The DoJ now has additional solid evidence of their intentions. Of course they will cry that “Hillary’s government isn’t legitimate!” like they did to Obama. But the fact remains that threats were tracked back to the right-wing extremists which led to arrests, trials and convictions. The part that is especially sweet is that apparently the government didn’t have to engage in illegal surveillance. In the deal that Cooper cut, he revealed that he made calls to some of the people who will be on trial in February. When Trump loses, he won’t be a voice of moderation, he will seek to incite violence. His supporters will keep making threats.. When they do, law enforcement will bust them for it. These thugs aren’t clever enough to understand that the dodges they used before won’t work now. We won’t buy the, “I was joking. I was being sarcastic.” lines or the “I didn’t intend to scare anyone.” crap anymore. Everyone needs to know that people are going to jail for this now.